Where now we might mark an important section in a text with an asterisk, or strike through it with a highlighter pen, medieval scribes and scholars often used a much more artistic approach. 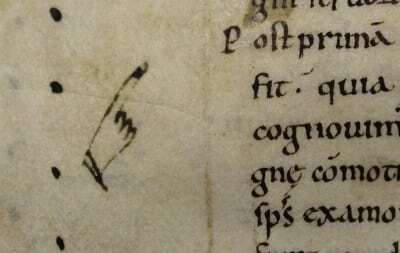 Here in the margin of one of St George’s Chapel’s fourteenth-century account rolls is a punctuation mark seldom seen in modern-day writing: the pointing finger, known more formally as a manicule. This name comes from the Latin maniculum, meaning ‘little hand’. 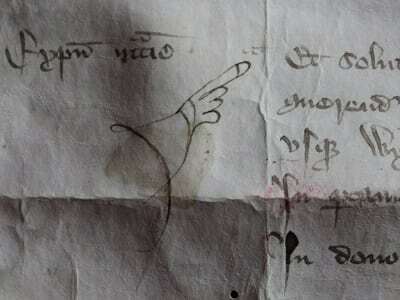 The manicule featured in this month’s image is found in one of the account rolls drawn up by John Loryng, who was a canon of St George’s Chapel, Windsor, from 1360 to 1387 and held the office of Canon Treasurer in 1362-3 and again in 1375-6. This roll (SGC XV.34.10) dates from the latter period and contains information about what the Dean and Canons spent on, amongst other things, stipends for the clergy and lay clerks, special services such as obits, repairs to college buildings, travel expenses and plants for the College garden. The section brought to our attention by this manicule comes under ‘necessary expenses’ and describes that ten shillings (x s, seen in the right hand margin) were paid for John Wyk to carry herrings for the College from Great Yarmouth to London and for Richard Pakynton to carry them on from London to Windsor. The importance of this payment is lost in the mists of time. We do not even know whether it was Canon Loryng who highlighted it or some later reader of the accounts. However, the manicule is drawn in an ink slightly darker than that used for the text of the account roll, suggesting at least that it was not added when the account was first drawn up. The earliest manicules appear in late-eleventh and twelfth century manuscripts and they grow in popularity throughout the medieval and renaissance periods. They come in all shapes and styles, and with both more and fewer digits than is the norm. This example, with its fat index finger and the suggestion of a wide-cuffed sleeve has something of the Disney character about it, but many have an anatomical accuracy which suggests they were sketched with great care and attention to detail. They are fantastic reminders of the human-ness of the scribes and scholars who would have spent hours, maybe even weeks and months, producing hand-written documents and occasionally found time for a little practical doodling in the margins. Later, printing led to the increased standardisation of punctuation marks and the manicule began to die away. Although still a recognised punctuation mark – a cousin of the bullet point or paragraph marker – it is seldom used, perhaps because a printed version lacks the character and style of the early hand-drawn forms. Perhaps it is also a consequence of the vastly increased speed and ease with which documents can be produced which leads people to feel the effort of drawing a whole hand is unjustified when a simple arrow would do the job just as well.